This page provides an overview of the kinds of things that XTide can do. How to do them will be explained in the next section. Graph mode gives you a plot of the water level (or water velocity, in the case of currents) versus time. The times of high and low tide (or max flood and max ebb) are printed across the top. Sunrise and sunset are denoted with different background colors; moonrise, moonset, and moon phases are shown along the bottom. A + mark on the graph indicates the conditions at the time that the graph was generated. For currents, the times of slack water are also shown along the bottom. If necessary, crowding of the bottom caption line can be relieved in several ways (see Advanced usage). Clock mode is similar to graph mode, but the captions are different and the window is automatically updated once a minute to show the latest conditions. 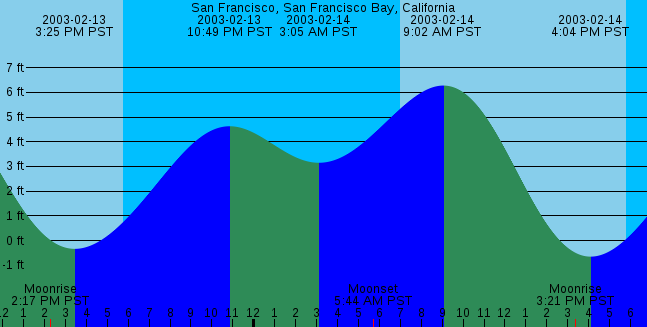 From top to bottom, the window shows the current time, the next high tide (or maximum flood), the predicted height or velocity for the current time (shown with a +), and the next low tide (or maximum ebb). Other events like slack water and moon phases do not appear. If a tide clock is iconified using an ancient window manager like twm, the icon will appear as a classic round tide clock that gives a vague idea of where you are in the tide cycle. Unfortunately, this feature is not accessible at all from newer windows environments that disregard the old icon protocol. Even some of the old window managers had trouble with it; they would crash, or the icon would fail to update. Plain text listing of events, no foo-foo. Calendar mode arranges most of the information available in text mode into a commonly used tabular layout. "Alt" calendar mode arranges the information into a traditional weekly calendar layout. Calendar mode is not available from the interactive client. Banner mode is a specialization of graph mode for output on old tractor feed dot matrix or line printers that use continuous reams of paper. Also useful as a workaround if your printing application does stupid things with color graphs. The graph is turned sideways and the aspect ratio is adjusted for Pica type. This mode is only available in the command line client. Stats mode is mainly for finding the highest high tide and lowest low tide within some period of time. However, it also provides an estimation of the Mean Lower Low Water datum based on the generated predictions. In cases where an authoritative benchmark for a station is not available, this can be used to derive a reasonable approximation. If the datum for the station has already been set to MLLW (as it should have been, for all U.S. stations) then the estimated value should be close to zero. Stats mode is only available in the command line client. Raw mode is for getting machine-readable output that can be fed into other Unix programs. The first column is a Unix time_t timestamp (seconds since 1970-01-01 00:00Z); the second column is tide heights in whatever units were selected for the location. Medium rare mode is just like raw mode except that the timestamps are "cooked" according to the date and time format settings that are in effect. List mode does not provide tide predictions at all. It is simply a way to get the list of supported locations from the command line client. The 'Type' column shows Ref for reference stations and Sub for subordinate stations. You should care about the difference. 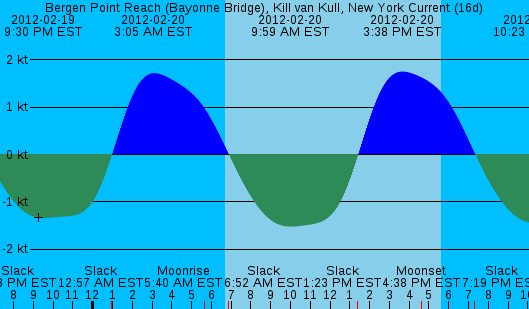 About mode does not provide tide predictions either. Instead, it shows the metadata for a station ("About this station"). XTide can render output in eight different formats: X-windows, HTML, LaTeX, iCalendar, PNG, CSV, SVG, or text. The X-windows format is implicit in the interactive client and can't be selected explicitly. The others can be selected in the non-interactive client and are invoked automatically by the interactive and web clients (e.g., when you save output to a file). The HTML and PNG formats are adequately demonstrated by the examples above in the Modes section. Calendar mode is kind of cramped in text format if you use all default settings, but it can be made to work by using a compact time format, setting a wider TTY width, and/or turning off sun and moon information. These are settings that you can change with the control panel or command-line switches. See Appendix C for related discussion. XTide can produce output in the Scalable Vector Graphics (SVG) format for graph and clock modes. Graphs in SVG format ought to look better in a web browser than graphs in PNG format, but unfortunately, fonts. Moreover, font metrics. Running LaTeX formatted output through pdflatex yields a PDF that looks approximately like this. See Appendix C for hints on obtaining the best results. The iCalendar format yields an .ics file that can be imported by standards-compliant calendar tools to put tide events on your schedule. It is only useful in calendar mode. CSV stands for Comma-Separated Values, a.k.a. comma-delimited. This rigid format is useful for importing XTide output into database and spreadsheet applications with fixed columns. Commas that are part of field values are replaced by the pipe character (|). In calendar mode, the columns in CSV format are: location name, date, five reps of (max time, max value), five reps of (min time, min value), ten reps of slack time, sunrise, sunset, moonrise, moonset. The number of columns allocated is controlled by the compile-time constants numMaxMin and numRiseSet in CalendarFormC.cc. Events exceeding the number of columns available are discarded with a warning. Moon phases and mark level crossings are just discarded.